Affordable Heading and Positioning Smart Antenna. Experience superior navigation from the accurate heading and positioning performance available with the V100 Series GPS Compass. The rugged enclosure combines Hemisphere GPS’ Crescent Vector board and two multipath-resistant antennas for portability and simple installation. The half-meter length smart antenna mounts easily to a flat surface or pole. The stability and maintenance-free design of the V100 Series replaces traditional gyrocompasses at a fraction of the cost. Professional Heading and Positioning Receiver. Precise applications demand the heading and positioning performance of the VS100 Series GPS Compass. Ideal for professional machine control and navigation applications, the VS100 delivers reliable accuracy at significantly less cost than competitors products or traditional methods. The VS100 Series receiver with its display and user interface can be conveniently installed near the operator. The two antennas are mounted separately and with a distance between them to meet the desired accuracy. 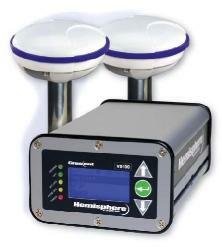 The affordable All-In-One DGPS Receiver Solution. Work smarter, not harder. The A100 Smart Antenna offers an affordable, portable solution with professional level accuracy for agricultural, marine, GIS mapping, and other applications. High accuracy, multipurpose receiver. Complete your work quickly and accurately with the R100 Series DGPS receiver. Rely on consistent sub-meter performance with standard SBAS differential and Hemisphere GPS’ exclusive COAST technology that maintains accuracy during temporary loss of differential signal. 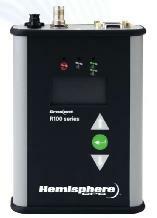 The R100 Series offers many differential correction options for various environments and worldwide coverage. The simple interface and solid construction make the R100 Series the ideal solution for professional mapping, guidance and navigation applications. Dual-Frequency RTK, High Accuracy Receiver. Complete your work quickly and accurately with the R220™ GPS receiver. Built on Hemisphere GPS’ Eclipse™ platform, it boasts the latest dual-frequency patented technology. It offers 39-channel tracking with extremely quick start up and reacquisition times. The R220 GPS Receiver utilizes RTK (Real Time Kinematic) for fast, reliable, long-range centimeter-level performance. In addition to RTK, it tracks GPS, SBAS and L-Band (OmniSTAR® HP/XP). It also features Hemisphere GPS’ exclusive COAST™, which provides accurate positioning data during differential correction outages.For professional mapping, guidance, machine control and navigation applications, the R220 GPS Receiver provides and extremely accurate, versatile and robust positioning solution at a more cost-effective price point than traditional dual-frequency RTK systems. These portable receivers are packed with features allowing them to provide accurate GPS positioning, in almost any environment, anywhere in the world.